Make ironing less of a chore. My mother is the queen of the ironing pile. Me? I have become a pretty adept folder. As a parent my Sunday’s are filled with cleaning the bathroom, folding socks and readying uniform. Trousers with pleats are the bane of my life. 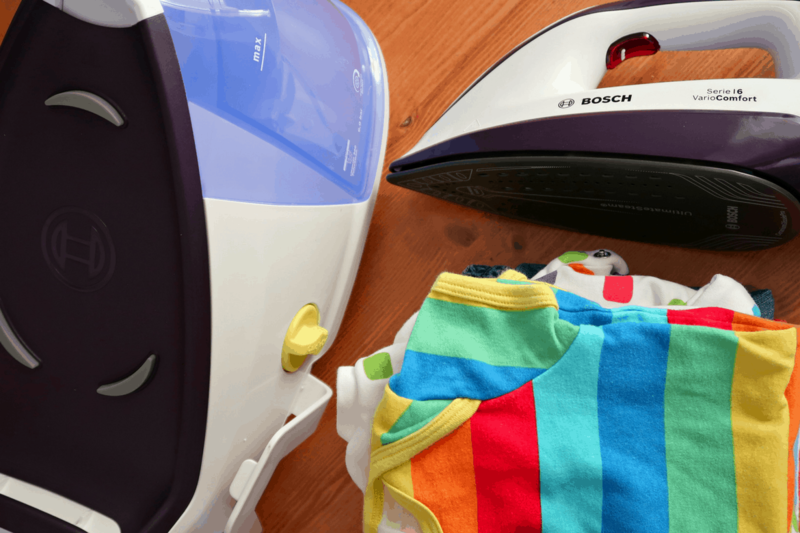 Whichever category you fall into, if your kids aren’t old enough to pay to do it, next time you pick up your iron make the task easier by following these simple, yet effective ironing tips. Iron in strokes, back and forth rather than in circles as this can stretch delicate fabrics. Don’t leave an iron on one area too long and if you do burn fabric use a lemon juice soaked rag to remove scorch marks. Move the fabric away from you not toward you as you iron, to avoid needless creasing. You may not want to waste life considering an ‘ironing order’ but for efficiency, start with ‘delicates’ whilst your iron is cooler. Alternatively get the least enjoyable items out the way first. With shirts, the bane of my life, do shoulders and collar, cuffs, then sleeves, roll up a towel and insert it in the sleeve before ironing. Ensure the water reservoir is consistently full. Irons can become the victim of limescale; but you can minimise the risk by filling the tank with distilled water. If we are talking simple fixes, vinegar is also great for cleaning your iron plate. Just rub it on with a damp cloth to remove residue from spray starch or fabric softeners. Ironing your dark clothes inside out will prevent the fabrics from getting a sheen on them. Never overfill the washing machine as clothes will get tangled and creased. If you use a drier, give your damp clothes a few very vigorous shakes before putting them in the tumble dryer. Remove clothing when they are cupboard dry or if they have been on the line remove them when they are slightly damp. A larger ironing board will offer you a bigger ironing surface so you can work faster as you don’t need to adjust the garment that you are ironing as often. You’ll want one that is lightweight yet sturdy a faulty board can also tip over and cause burns and other accidents. Set the table according to your height. Make sure that the cover has sturdy padding that’s even throughout, and get one with a non-stick finish, and if possible, a reflective surface. Putting a sheet of aluminium foil (shiny side up) between your ironing board and the ironing board cover will basically items from both sides at the same time. Adhere to the garment care labels and make use of the adjustable heat settings. When changing the temperature of the iron let it sit for a couple of minutes to adjust. Invest in a good iron. Bosch is synonymous with reputable, reliable products. The Serie 6 ProHygenic is a high quality iron and steam station, one of the fastest and most effective when it comes to taking creases and wrinkles out of clothing. Delivering professional results this model offers 2400 watts of rapid heating which generates steam quickly so you can zoom through your laundry. The large tank capacity stores a good quantity of water so you are not constantly refilling. The only downside is that the iron and base is a tad weighty. That said if you want a good press, an iron that is too light will not do the job. There is no need to press down hard, especially when using steam. With the irons 400 PulseSteam technology you don’t have to go over and over stubborn creases as the deep steam output rate gets rid of them in a blink. Moving the iron is easy given the secure lock base. Tired of finding grit and limescale on your clothes when you’re ironing? Descale your iron with ease thanks to Bosch Calc’n Clean Advanced system. The easy to use temperature setting and steam pressure also removes up to 99.9% of common microbes from all materials in the Hygiene programme. What this means is that you can wash on cool without the need for chemicals to ensure children’s clothes are germ free. Additionally the Eco button cuts down on water use and makes the iron more efficient. Worried about security? The iron switches off after 30 seconds when horizontal or after 8 minutes when standing on its base in a vertical position. This is a very convenient, safe and modern function that ensures worry-free ironing for the family home. Overall this is a fantastic buy and worth investing in. Are you a fan of ironing and do you have any tips or tricks? Note: We were gifted the iron for the purpose of this review. All options are our own. No wonder you knew the tips on how to clean my iron The other day! This says it all ?